Open displays in the kitchen are very on trend with one form of these displays being the hook rail system. A solid bar hooked mostly commonly with S shaped hooks, these storage pieces are both functional and beautiful. They come in metal or wood and easily could be made from a bathroom towel bar. Of course, they really only look well styled when not over cluttered and hooked with visually appealing kitchen tools. Check out some nice examples below. 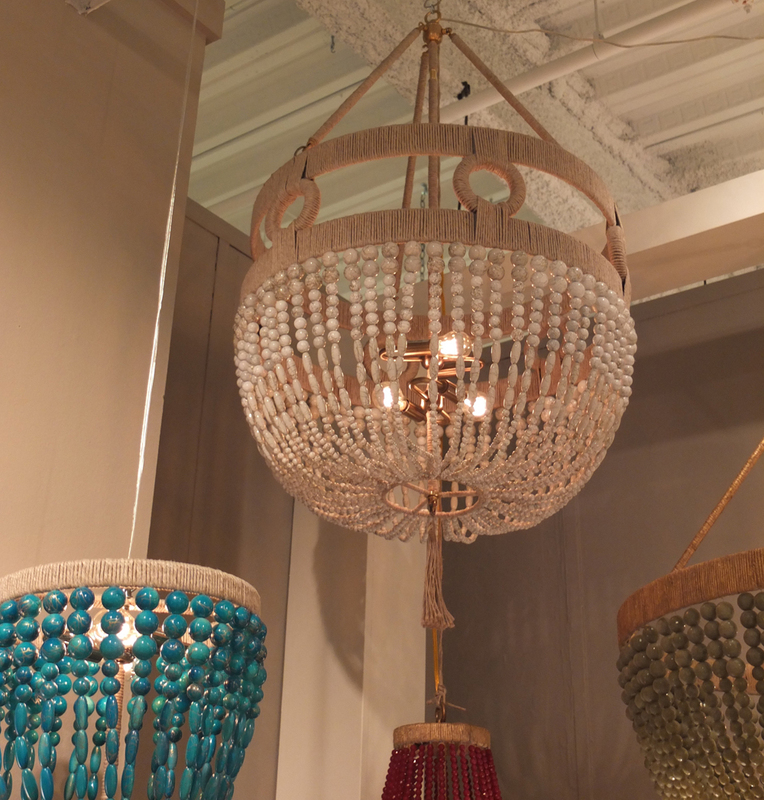 I have been back from High Point Market for a week so I better blog about it before I forget all the amazing things I saw. High Point Market is in High Point, North Carolina which is roughly an hour and half from both Charlotte and Raleigh-Durham. It is the world's largest furniture trade show bringing over 75,000 people every 6 months to its massive showing of furnishings. Imagine a mini city of roughly 180 buildings encompassing 11.5 million square feet of showroom space....not the easiest thing to do I realize. Trams and shuttles run people building to building in a very Disney-esque manner while inside the larger of the buildings you lose a concept of time and direction. The show was much bigger than I had imagined and I left Market wondering how such a huge event had come to a seemingly small town in the South (insert Wikipedia knowledge). High Point Market, originally Southern Furniture Market, began in 1909 and became a fixture in the furniture industry when it opened its first large showroom building in 1921. Minus a lull during the World Wars, the Market has continued to grow with each passing year drawing a larger crowd and more vendors with each bi-annual event. We left St. Louis on Saturday morning and arrived to Market in the early afternoon. Luckily, we had prepared a list of vendors to visit or else I have no idea how you would know where to start. We tackled one of the largest buildings first - the International Home Furnishing Center commonly called IHFC. I think we spent four hours or so traversing the building's 11 floors and by the end were quite tired. We exited and spent a short time in another one of the larger but much more manageable buildings - the Suites at Market Square. By 8pm, when the market closes, we were exhausted. We found a yummy, local pizza place with a large tap menu and ended the day trying to get our heads around all that we had seen. Sunday started at 8am with a plan to do all the smaller vendors which we would have to walk to outside. Storms were forecasted for Monday so we knew we needed to cover a lot of ground or else be forced to do it in the rain. We started back at the Suites at Market Square and then jumped vendor to vendor until 7pm when basically we could no longer walk another step. If I get a chance to go back, I am definitely getting one of those step readers as I don't think I have walked further in 2.5 days in all of my life. Monday was our last day and much like we anticipated it was cold, rainy and generally miserable out. We again started at the Suites at Market Square (did I mention this is where the Starbucks was?). This time we took our time touring the antique vendors before making our way to some of the more outlying showrooms and antique stores on our way out of town. Highlight of the day might have been a trip to Biscuitville. I usually won't set foot in a fast food restaurant but I am a sucker for Biscuits and let me tell you I was not disappointed. We arrived back in St. Louis late Monday night totally exhausted. It was amazing trip and like I have said I saw so many beautiful pieces of art, furniture, lighting and accessories. I am going to take my time featuring my favorite vendors as there is so much to share from each one. In the meantime, here are a few teaser pictures.